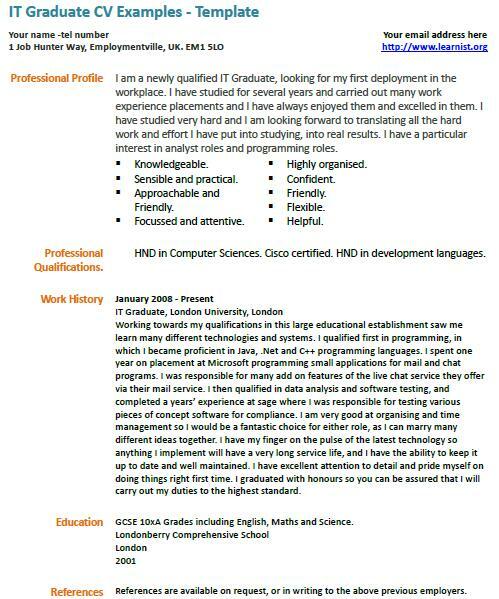 IT Graduate CV Examples – Template. Amend this CV sample as suitable and write your CV in minutes. I am a newly qualified IT Graduate, looking for my first deployment in the workplace. I have studied for several years and carried out many work experience placements and I have always enjoyed them and excelled in them. I have studied very hard and I am looking forward to translating all the hard work and effort I have put into studying, into real results. I have a particular interest in analyst roles and programming roles. HND in Computer Sciences. Cisco certified. HND in development languages. Working towards my qualifications in this large educational establishment saw me learn many different technologies and systems. I qualified first in programming, in which I became proficient in Java, .Net and C++ programming languages. I spent one year on placement at Microsoft programming small applications for mail and chat programs. I was responsible for many add on features of the live chat service they offer via their mail service. I then qualified in data analysis and software testing, and completed a years’ experience at sage where I was responsible for testing various pieces of concept software for compliance. I am very good at organising and time management so I would be a fantastic choice for either role, as I can marry many different ideas together. I have my finger on the pulse of the latest technology so anything I implement will have a very long service life, and I have the ability to keep it up to date and well maintained. I have excellent attention to detail and pride myself on doing things right first time. I graduated with honours so you can be assured that I will carry out my duties to the highest standard. GCSE 10xA Grades including English, Maths and Science. References are available on request, or in writing to the above previous employers.